A reliable source for Stair Tower information and a resource for accessing leading Stair Tower and suppliers. Stair towers are mezzanine components used, as one might assume, for climbing. Specifically, they used to climb multi-level mezzanine structures. They are strong, stable and keep you and your employees from slipping or falling. 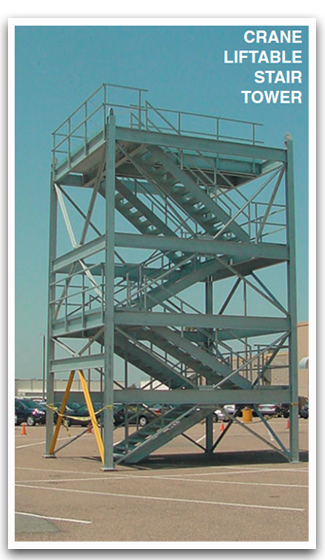 Primarily, stair towers are popular in warehousing, civil engineering, construction and access and scaffolding. Stair Tower Stair towers are mezzanine components used, as one might assume, for climbing. Specifically, they used to climb multi-level mezzanine structures. Unlike regular stairs, stair towers are usually independent, self-supported structures that users can relocate at will. Stair towers feature open or closed risers and may even be enclosed in a protective cage. Open riser stair towers feature risers, or steps, with space in between them. Closed riser stair towers feature steps that are fully closed. For safe walking, their equipped with steel treads. Treads may have any number of patterns, including diamond plate, perforated and open grate. Because they must be so rugged and strong, stair towers are almost always built from high tensile strength galvanized steel. Sometimes, though, they’re made from lightweight aluminum. These are best for flexible and easy access solutions. They may be welded or bolted together. Manufacturers have a fair amount of design flexibility with stair towers. For example, they may put landings at any point and they may create a number of exits. Exits lead to rack modules or even the exterior of buildings. They can also vary their width, length, modularity, mobility and load bearing capabilities. Stair tower manufacturers also offer their products in a wide variety of colors. Stair towers have a number of advantages. First, they are versatile. It’s easy to adapt them to different settings. Second, they are simple and fast to install. Third, they are durable and reliable. When well designed and well-matched for your application, stair towers provide a high level of safety. Good manufacturers will always make sure that your stair towers meet building codes specific to your space, as well as IBC (International Building Code) and OSHA (Occupational Health and Safety Administration) codes. Find a reliable, high quality manufacturer by checking out those we have listed on this page. Stair Tower – Abtech, Inc.